Koala Lifestyle assembles our rolling paper bundles to ensure customers receive amazing products at a killer value. 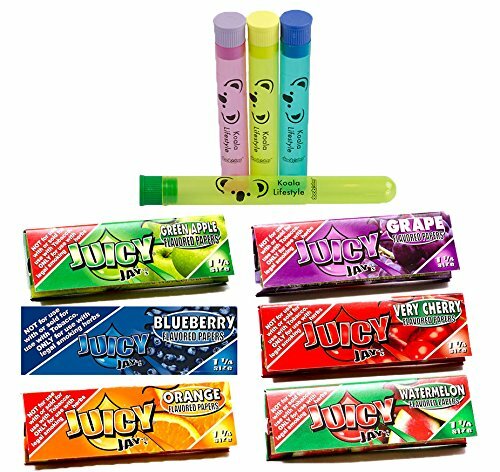 This Bundle is composed of 100% authentic Juicy Jays products and our own American Made Koala Lifestyle Doob Tubes. Our American Made Koala Lifestlye Doob Tubes are the perfect container for storing your pre-rolled medicine. Small and compact, these innovative storage containers fit neatly in your pocket. Carefully designed to keep your medicine safe and discreet, Doob Tubes are ideal for when you are on the move. Made from durable poly-carbonate plastic, these air-tight, odor-containing, moisture-resistant containers will last for many years of use. You can even store half burned cigarettes in them. The small size (fits up to 110mm papers) is 4 1/8 inches long and the large size (fits anything else) is 5 1/2 inches long. If that's not enough reasons to buy them, consider the fact they are 100% American made. Literally every ingredient that goes into these (even the ink that prints our awesome Koala logo) comes from right here in the USA. Doob Tubes is veteran owned and run so you're supporting our troops as well.